The Series SSV-S solenoid valves are two-way guide type solenoid valves utilized in applications for water, gas, air and other liquids. 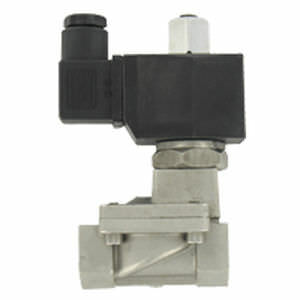 The compact, general-service valves are constructed from stainless steel and have a normally open design. They can be orientated in any position. Protection is given against dust and the seepage of non-corrosive coolants and oil by the solenoid cover. The Series SSV-S operate at a maximum temperature of 120°C (248°F) which is possible due to the fluoroelastomer seal. Numerous flow ranges and valve sizes are available with orifices from 3 mm to 50 mm and connection sizes of 1/8" to 2" NPT.